Incredible Shrinking Equity - Epoch Investment Partners, Inc. The current and future destruction of equity capital within the banking system and its impact on the real economy. Epoch has published several commentaries1 on the growing residential housing bubble that burst with a fury in 2007. Part and parcel of this unwinding has been the destruction of equity on bank balance sheets, caused not just by loans gone bad, but by the derivative instruments tied to these loans. Our view is that the destruction of equity within the banking sector is just beginning, and that further destruction is necessary for us to reconsider our bearish stance on financials. If we’re to discuss the erosion of equity, it will help to understand how, why and where the initial equity build-up originated. Equity, we have been taught, is the sum of owner’s capital contributed to and net income earned by an enterprise, less distributions to the enterprise’s owners. From an accounting standpoint, it is the mathematical difference between assets and liabilities. For a highly leveraged institution like a bank, it is the cushion that the bank’s depositors and note holders depend on to shield them from credit losses. For the bank’s regulators, equity is a measure of a bank’s safety. The banking system depends on growth in equity to fund growth in loans. Lastly, for equity holders, it represents not just a theoretical floor value for their investment, but also a future source of distributed earnings and growth capital. The accounting definition of equity, or “book” equity, is controversial, as it does not take into account the change in value of assets or liabilities after they have been placed on the balance sheet at cost. 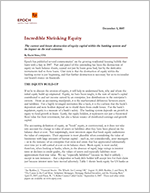 Not surprisingly, most investors argue that book equity understates the value of companies. Their argument is most plausible when considering the value of businesses with large amounts of human capital – such as, not coincidentally, asset managers – or in the instance of an enterprise that owns real estate that has appreciated substantially over time yet is still carried at cost on its balance sheet. Book equity is most useful, therefore, when looking at banks, where, in the absence of rapid, large swings in interest rates or declines in credit quality, the values of assets and especially liabilities most approximate their true value. We say “especially liabilities” because we find it unlikely – except in rare instances – that a depositor or bank debt holder will accept less for their claim just because interest rates have moved adversely. Table 1 shows book equity for US banks as a percent of assets since 1984, the earliest date for which we have complete data for both commercial banks and thrifts. In this table, we’ve also included tangible equity, as it is strips out intangible assets created by mergers and acquisitions. As one can see, even on the more objective tangible equity measure, bank balance sheets have seemingly strengthened over time, with nearly eight cents of equity retained or invested for every dollar of assets added to the balance sheet since the end of 1984. On a regulatory, or Tier One capital2, basis, banks in their entirety have held more or less steady at 10.3% of risk-weighted assets since 1992, the first year for which industry-wide data is available. As bank balance sheets have statistically improved, so has their profitability, as measured by returns on average equity and tangible equity, as shown in Table 2. (b) Divides full year net income by the average of beginning and ending equity and tangible equity respectively. 2007 multiples net income by two and divides by the average of beginning and ending values for equity and tangible equity. The improved return on equity can be attributed to three factors not unique to banks among American businesses: an increase in fee and service income; improved efficiency; and, of course, increased leverage. The average bank in 1985 generated 29% of its net revenue from non-interest income, had operating expenses equivalent to 72% of net revenue, and borrowings equivalent to 12% of its total funding3. Through the first six months of 2007, these metrics equaled 43%, 56%, and 21%, respectively. The growth in non-interest income resulted, in part, from forays into asset management, trading, and insurance, aided by the steady erosion of the Glass-Steagall Act and the subsequent creation of “supermarkets” like Citigroup and JP Morgan Chase. The decline in operating expenses resulted from the corporate world’s general drive toward leanness, and also reflects the impact of mergers and acquisitions, which reduced the number of banks (and thus overhead, overlaps, and such) from over 18,000 to 8,600. As for the increase in borrowings to total funding, banks have used leverage to grow interest-earning assets in the absence of sufficient deposit growth, which speaks as much to banks’ desire for higher ROE as it does to Americans’ dearth of savings. Investors have benefited from this industry-wide improvement in equity generation. Net income for the banking sector grew by 8.5% annually from 1985 through mid-2007. The KBW Bank Index, a market-cap weighted index of 24 large national and regional banks, appreciated by an average of 10% annually from the beginning of 1985 through June 30, 2007, in line with the S&P 500. The composite P/E ratio of the index nearly doubled from 6.7 to 12.8, as shown in Figures 1 and 2. Additionally, of the cumulative $1.45 trillion of net income generated by US banks since the beginning of 1985, nearly 68%, or $982 billion, was paid out as dividends. In recent years, a flat-to-inverted yield curve, which caused narrow net interest spreads on loans and securities, depressed returns on equity. But, as we head into the likely end of a credit cycle, banks are nevertheless at higher levels of balance sheet strength and profitability than during the last comparable credit cycle in the late 1980s. So why, you might ask, do we harbor such serious concerns about the investment-worthiness of the banking sector? Epoch has been underweight in financials for some time owing to early concerns about this credit cycle and its excesses: namely, the high level of house price appreciation, record consumer debt to income, and a securitization model run amok that functioned only when liquidity was cheap and available. Now that some (but by no means all) of the chickens have come home to roost – as seen in increasing mortgage defaults and leverage-amplified losses in the financial system – it seems reasonable to us that the banking sector should be viewed with caution, despite external indications of balance sheet strength. Our primary supporting argument in this regard is the destruction of equity. Charge-offs, along with realized security losses, are the purest forms of equity destruction. According to the FDIC, the median bank saw its net charge-offs as a percent of loans & leases increase sequentially by 7 bps to 57 bps annualized in the third quarter of 2007. These levels are hardly unprecedented or cause for immediate panic. According to FDIC data, in 1990 and 1991, during the savings and loan (S&L) crisis, net charge-offs totaled between 120 and 135 basis points, respectively, when measured on year-end loans. To give a sense of the speed with which charge-offs accelerated, 1988 and 1989 showed net charge-offs of 67 and 80 bps. More recently, in 2001 and 2002, net charge-offs equaled 81 and 93 bps. According to our research, the worst year on record was 1934, when full year charge-offs totaled 342 bps of year-end loans4. Today, we are nowhere near these metrics. But the distinct upward trend of recent charge-off activity still warrants a careful and measured approach to banking sector investments. While equity creation (through net income and security price appreciation) results in growth in earning assets and shareholder returns, its destruction generates the opposite effect. Consider how equity is required to create new loans. To be considered adequately capitalized, a bank must hold 4% of so-called Tier One capital against its loan and securities portfolio, adjusted for risk. The adjustment considers the riskiness of different classes of assets and requires more or less capital to be reserved as a result. So, for example, the risk-weighting for a residential mortgage under the Basel II – Standardized Approach5 is 0.35, such that a $200,000 residential mortgage loan would require $2,800 of capital reserved ($200K * .35 *.04). For a commercial mortgage, the risk factor is 1, thus a similarly-sized loan would require $8,000 of capital. Unsecured corporate loans have risk weights of 0.2 to 1.5, based on the creditworthiness of the borrower. It is rare for a bank to brush up against the 4% minimum for Tier One capital. In reality, banks typically achieve at least a 6% Tier One ratio, which earns the bank a “well-capitalized” designation. Citigroup, with the broadest array of businesses among all US banks, targets a 7.5% Tier One ratio. With these factors in mind, one can see how equity destruction can severely curtail a bank’s ability to fund new loans well in excess of the actual equity lost. Given the current and future weakness in the sub-prime space, it is worth examining the manner in which this phenomenon will affect not only the equity erosion issues in the banking sector, but within the financial system as a whole. The OECD estimates that $300 billion of the estimated $1.3 trillion of sub-prime loans will ultimately be written off6. This $300 billion loss can be viewed as equity destruction: it will be borne by equity holders first, not insured depositors or senior debt-holders. Equity holders own the “junior tranche” in the parlance of structured finance. To put this in context, this represents roughly a quarter of the equity in the US banking system, and roughly two years of industry net income at the current ROE of 11-12%. Now, of course, due to the miracle of securitization, US banks and their equity-holders are no longer on the hook for some of these loans, as they have long since been sold to hedge funds, mutual funds, institutional investors, and foreign banks, to name a few. Those institutions have their own equity holders, and should losses eat through their equity, the institution’s debt-holders would then bear further losses, absorbed by their equity, and so forth. In addition, US banks may hold other banks’ securitized loans in their own securities portfolio. So, as a result of the dispersive effects of securitization, US banks will not absorb 100% of the losses related to the sub-prime collapse. Perhaps, then, the $300 billion equity loss should be viewed in terms of the system-wide multiplier effect it has on new loan creation. Simple math7 tells us that an “average” bank could use that $300 billion to create $3 trillion of new loans assuming an overall risk weighting, for simplicity’s sake, of 1. This lost lending power is a devastating, but not deadly, blow to the banking system in its entirety. There is roughly $1 trillion of Tier One capital in the banking system, and risk-weighted assets of $10 trillion. Thus, removing $300 billion would still the leave the system with an overall 7% Tier One ratio, above the 6% necessary to be considered well-capitalized. That being said, however, some institutions will not remain solvent, and loan growth will necessarily slow, in order to re-fortify bank balance sheets. This slowdown will be triggered by the requirement to hold more equity against new loans. In Epoch’s Shareholder Yield investment framework, more equity on the balance sheet means less equity available to distribute to shareholders, with the exception of a select group of overcapitalized entities. The key to making successful investments in the banking industry, therefore, is to identify the companies that are still able to return capital directly to shareholders. Hudson City Bancorp and People’s United Financial are two such examples, both of which are owned in Epoch’s portfolios. At What Price, New Equity? The question of equity destruction begs the additional, and equally crucial, question of equity re-creation. Freddie Mac, for example, recently reported it is barely above its regulatory capital requirement due to a $2.1 billion loss in its third quarter. Faced with this erosion in equity, Freddie had two choices: restrict lending, or seek new capital. It chose the latter, and is now publicly seeking up to $6 billion of new funds via a preferred equity offering. Or, consider Citigroup, which announced the sale of $7.5 billion of convertible securities to the Abu Dhabi Investment Authority with a pre-tax cost of capital of 11%. In today’s environment of declining equity availability, banks both large and small may not have a choice but to raise expensive new capital if they wish to remain well or adequately capitalized. The relative P/E of bank stocks (see Figure 3), a crude measure of how favorable conditions are for banks to raise equity, historically has troughed during economically stressful periods: the “first wave” of the S&L crisis in 1982-1983, corresponding with historically high short term interest rates; the 1987 stock market crash; the “second wave” of the S&L crisis in 1990; and the bursting of the Nasdaq bubble in 2000. We would argue that the current spate of sub-prime related losses (not to mention those on LBO loans) is our new “stressful period,” which seems even more likely given the run-up in consumer and corporate leverage during this cycle. Another potential hindrance to the generation of new equity is the origin of the equity in question. Although ADIA’s investment in Citi, with its myriad troubles, appears to have passed regulatory muster, suspicion of sovereign wealth funds (SWFs) runs deep in the US political system. This should cause skepticism among those looking for SWFs to replace damaged equity in the US banking system en masse. We ask: with the cost of new equity high and likely to increase, and equity generation consumed by write-offs, from where will the new equity come? We don’t know the answer. And, if nobody else does, it is not just the banking system that is due for a slowdown, but any entity reliant on credit. The financial economy and the real economy are two sides of the same coin. When one side has a problem, it affects the other. Credit is contracting in the financial system as bank equity shrinks and structured finance comes under a dark cloud. It is inconceivable, therefore, that a contraction in the financial economy will not affect the real economy. In our view, a broad-based economic slowdown is inevitable, as household leverage shrinks and residential investment continues its decline. Are there any actions the federal government can take? In the past, Uncle Sam has been particularly ham-handed at managing banking crises. For example, in response to the “first wave” of the S&L crisis in 1982-83, the government, in a fit of ill-considered policy decisions, reduced capital requirements at banks, allowed banks to include goodwill incurred from purchasing failed thrifts in their capital calculations (and then disallowed it), and reduced certain loan-to-value limitations. In the spirit of deregulation, the Reagan administration weakened both the requirements to start a new bank and the number of regulatory staff enforcing existing bank laws. Count us among those skeptical that regulatory or legislative action can have a meaningfully positive impact on the banking space. In fact, the opposite may be true. Which leaves, then, the American taxpayer. The US General Accounting Office estimates that the final cost of resolving failed S&Ls in the early 1990s was just over $160 billion, including $132 billion from federal taxpayers. We are by no means projecting an economic fall-out of this magnitude, but we do see distinct similarities between our current situation and the S&L crisis. With Fannie & Freddie on the ropes, and a presidential election in 2008, some form of government intervention is possible. We think this could come in the form of a cash infusion or guarantees issued by the US Treasury. At certain points in the economic cycle, bank stocks become attractive. Given what we currently know, however, concerning the fall-out of the sub-prime collapse and the destruction of banking sector equity, we would tread cautiously. Bank stock performance troughed roughly at the depths of the past two recessions, in Q3 1990 and Q3 2001 after the Fed cut rates 175 and 350 bps, respectively. Note that the Fed continued to cut rates, by another 500 bps after Q3 1990 and 200 bps after Q3 2001. On a positive note, the 10-2 year spread, a leading indicator of bank stock performance, has turned positive for the past two quarters after almost five quarters in negative territory. A similar upward trend in the 10-2 year spread also signaled a turn in bank stocks prior to the two aforementioned recessions. However, audited year-end financial statements, due in February and March, could reveal further stress in the system and cause another leg down in stock prices. Additionally, the corporate-spread (10 year swap less three month LIBOR) has remained flat, while it had turned significantly positive in by 3q 20018 . Sub-prime issues will also likely amplify the effects of the trough in the upcoming credit cycle. As we slowly and painfully exit third quarter reporting (and re-reporting) season, it is important that we distinguish between originators and distributors of credit (i.e. thrifts, commercial and investment banks) and others within the financial space. For example, a company like Bank of New York Mellon, an asset manager and transaction processor, is in an entirely different boat than a conglomerate like Citigroup. We have a much more positive view of fee-based businesses than we do of Citi, with its large book of on- and off-balance sheet loans. However, if our negative view of the credit origination and distribution space is correct, the outcome of widespread equity destruction has the potential to pummel the consumer and reduce profits in all segments of the market. Other solutions may emerge, such as government-guaranteed bond issuances similar to the Brady Bill program that helped Mexico weather a crisis in 19949. Nevertheless, it seems that substantial amounts of equity, generated over decades, is poised to be wiped out in a matter of months. The resulting weakness in the banking sector will represent another casualty, we believe, of the ongoing sub-prime collapse. 1See Reddan, J., “Financial Stocks: The Wheels Are Coming Off,” August 15, 2005; Reddan, J. and Priest, W. “The Canary in the Coal Mine: Subprime Mortgages, Mortgage-Backed Securities, and the Housing Bust,” April 23, 2007; and Priest, W, “A Roller Coaster Called Credit,” September 4, 2007. 2Tier One capital is essentially tangible capital plus qualifying preferred equity and minority interests, less unrealized security gains, with a few other minor adjustments. A bank or bank holding company with a 4% Tier One ratio is considered adequately capitalized, and a 6% Tier One ratio is considered indicative of a “well-capitalized” bank. 3Here, we define total funding as deposits plus borrowing, as they fund the near-entirety of earning assets such as loans and securities. 41934 data is for commercial banks only. Comparable data on savings institutions unavailable prior to 1984. 5For the purposes of our analysis, this approach is more straightforward than the Internal Risk Based approach. 7Take the $300 billion of equity lost and divide it by the average Tier One capital in the US banking system of 10%. 8We do not have ten year swap data prior to July 2000. 9In the view of William Priest, CIO of Epoch Investment Partners, this is the only way the super SIV can work. To “defrost” the seizing of liquidity in the ABCP will require a “guarantee” of the principal value of the underlying collateral.